The Broads Internal Drainage Board (IDB) are undertaking a 12 week major engineering project at Horsey Staithe from the 3rd September 2018, in order to replace a damaged culvert. In January 2016 the wooden culvert which takes the IDB watercourse under Horsey boat dyke failed, allowing water from Horsey Mere to spill into the surrounding area in a dangerous and uncontrolled manner. This threatened the flood defence, the environment, as well as local infrastructure and emergency works to temperately stem the flow were carried out. Government funding has now been received, which will enable a full culvert replacement to be completed. The Norfolk Broads is not a landscape of chance, it is a living landscape of engineering ingenuity and skill. The work we are carrying out represents the latest in a long line of projects, which help to hold the landscape in its finely balanced structure. This is a major civil engineering project, replacing an oak box culvert from the early 1900’s, which will help maintain Horsey Mere and its surrounding landscape for the next generation. We are starting work on 3rd September, after the school summer holidays. During July and August we will mobilising our equipment onto the marsh, and starting the stockpiling of clay material, so that everything is in place to enable us to be ready to start work without any delays. Environmental mitigation for protected species, to facilitate the works, such as vegetation cutting and monitoring by ecologists, will also start during this period. Whilst work is being carried out no public or private moorings will be available, as in order to rebuild the culvert we will need to put sheet piles across Horsey Staithe, cutting off the access. To compensate for this, we are installing 50m of linear pontoons to create temporary moorings for use by all, including Ross’ Wildlife Boat Trips, who will have a dedicated mooring. We will also be diverting the footpath to enable people to access the area with minimal disturbance. Local footpaths and access will be affected during works, with footpath diversions and closures in place from 3rd September. 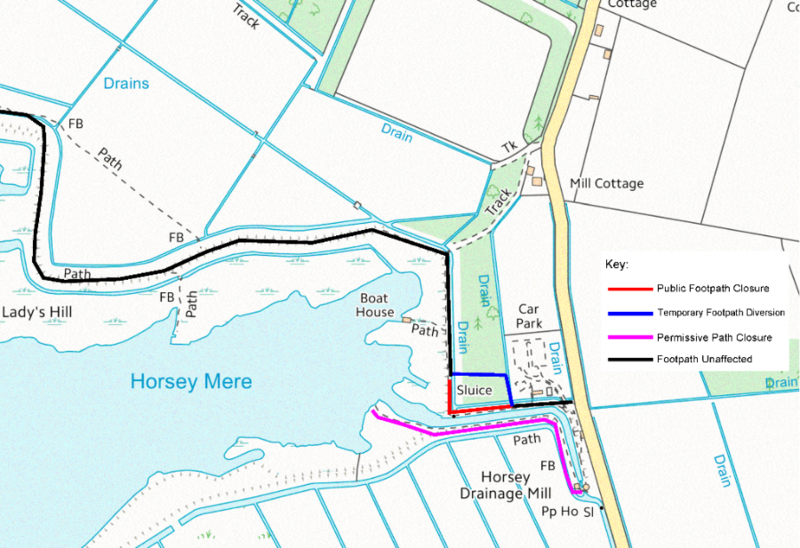 Road access will not be impacted and by using the pontoons visitors will still have access to Horsey Mere and the businesses within it. The floating pontoons are made from high molecular weight polyethylene with an anti slip surface. Each square metre provides 350kg of buoyancy with a safe working load of 175kg – a correctly configured installation will support a tank! We are working closely with the National Trust to ensure Horsey Mill and the visitor centre and tea room will not be affected by works being carried out.